The children have been back at school for a couple of weeks, we're settling into our post-summer routine and I'm starting to focus on sewing for the cooler months. As it happens, the Love Sewing magazine I bought last week had McCalls M6886 as the free pattern and I was really excited to give this one a try. Everyone and their mother raves about it. I just needed to go find some fabric. Then, last night, I remembered I already had the perfect fabric for it! I can see why everyone loves it. It's a very easy and speedy sew, unless you're using my machine - but more about that in a minute. The pattern is super simple. I picked the length of view D and added the long sleeves to it. I cut a size 10 and graded it out to a 12 on the hips - the finished measurements made me think the 10 would be too tight. However, once sewn up, I had to swallow the excess back up around the hips anyway. So next time I'll just make a straight 10. The fit is great. It's flattering, quite fitted and not at all uncomfortable. I have a little bit of excess fabric on the back but I'm happy to leave it there because: a) I don't know how to deal with it and b) it doesn't bother me. Plus, I like that it isn't restrictive in any way and I'd be worried about making it too tight. Extra bonus: excess fabric makes for meal-appropriate attire. The instructions are a bit iffy. I didn't follow them and just did my own thing. But there's no mention of stabilising the shoulders - which I did - and they have you sew up the side and sleeve seams before setting in the sleeves. Bugger that! I sewed the sleeves on flat then closed up the side from cuff to hem - as I usually do for knits. 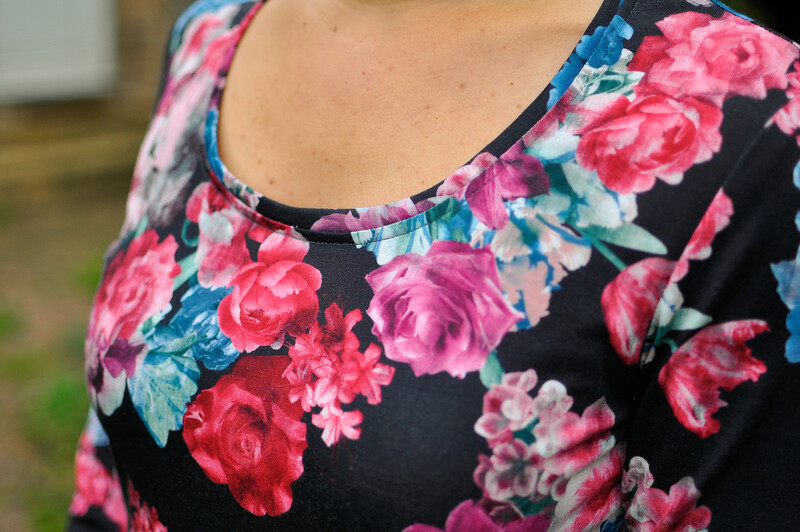 The pattern also instructs you to just turn over the neckline by 1.5cm. I really don't like doing this so I made my own band by measuring the neck opening and cutting a band 10% smaller. I traced the pattern in the afternoon - all pieces, for all versions - and cut it in about 20 minutes. The actual sewing (shoulders, sleeves and sides) took about an hour. I left the hemming/finishing to do today but my machine decided to throw a hissy fit and not cooperate. Skipped stitches and threads breaking ALL. DAY. LONG. Gaaaaaahhhhhh!!!!!!! There was a lot of swearing going on. Loud swearing. Seriously, I don't understand why it becomes so difficult as soon as we start dealing with more than just 2 layers of fabric. But it's done now. The fabric - which is still in stock - is great. I didn't know it was polyester until I just read it on the website right now. When I go into Fabworks, my brain switches to must-buy-all-the-fabric mode and all bets are off. I don't normally buy polyester but obviously the pretty flowers won me over. Having said that, it's very soft and lovely to work with. Also, I made the dress with cooler months in mind so being too hot in it shouldn't be a problem.